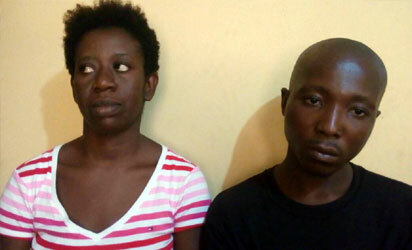 A 41-year-old wife was arrested by men of the Nigerian Police for allegedly hiring assassins to kill her husband has opened up on why she took the grave step. Mrs. Chika Orji was arrested by men of the Area ‘J’ Command, Ajah, Lagos State after one of the assassins, Bright Ikechukwu, hired by the woman was nabbed while trying to break into the victim, Mr. Orji’s house in Jakande Estate, Ajah, Lagos state. Mrs. Orji however during interrogation said she only hired the thugs to beat Mr. Orji up. She said: “we got married 14 years ago and are blessed with three daughters and a son. All of a sudden, my husband became a wife beater. He would beat me, leaving me with a swollen face and would also threaten to kill me. “He chased me out of the house three years ago. I made several efforts to get my children back, part of which was to report him to human rights offices for settlement. But he did not honor any of the invitations. Both families have made attempts to settle us, but he would not listen. Mrs. Orji continued: “Along the line, he sold the house we both built for N85 million, but never gave me any dime. “He also stopped our children from visiting me and any attempt to see them always resulted in beating. Out of frustration, I told Ekene, our carpenter, to beat him up. I did not pay him or hire anyone to kill him. Contrary to Mrs. Orji’s claim, the arrested suspect, Bright Ikechukwu, has maintained that she hired them to kill her husband. He said: “She paid us to kill him”. Bright Ikechukwu further maintained that he was contracted by Ekene to kill Mr. Orji for the sum of N500,000.